Giving Birth Naturally: November Giveaway: 3 Lucky People Will Win! November Giveaway: 3 Lucky People Will Win! We're excited to offer another Giveaway this month! Enter to win one of 3 prizes. Multiple entries per person accepted all month long (see How to Win for full details). 2 lucky winners will each receive a $20 e-gift certificate to Earth Mama Angel Baby, the online source for all natural organic, clinically tested, zero toxin, hospital-recommended products to support mothers and babies through pregnancy, birth, breastfeeding and baby care. Every Earth Mama Angel Baby product is made with only pure, plant-based, worry-free ingredients. 1 lucky winner will receive a DVD of the documentary film, Laboring Under an Illusion: Mass Media Childbirth vs. The Real Thing, by Vicki Elson, MA, CCE. 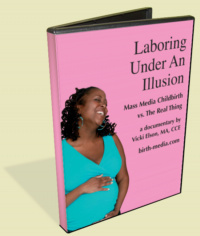 This film is a wonderful resource for expectant families, childbirth educators, doulas or birth junkies in general. Challenge your childbirth preconceptions as you watch videos of real births interspersed between mass media's cliched portrayals. Leave a comment on this post or in our Facebook Discussion thread, answering the question: What is/was your #1 reason for choosing natural childbirth? Add a photo from your homebirth, a belly shot, or a photo of your NCB baby to our Facebook Fan page (1 additional entry earned per photo per day). The giveaway ends Friday, December 3rd. There are no geographical restrictions. This giveaway is open to all. The winners will be contacted via email. If any of the winners do not respond within 3 days, a new winner will be selected and notified until all prizes have been awarded. The winners will be announced on Monday, December 6th both here on the blog and via Facebook. Please bookmark our blog, Like us on Facebook or Follow us on Twitter so you can see if you've won. Welcome and congratulations on becoming a new mom - from a fellow UC mom and birth junkie. My number 1 reason for giving birth naturally with my kids was that it just made sense...plain and simple! Our bodies were designed to do it and we are capable without all those interventions! Love this website! The home birth of Aurora! When I decided to attempt a VBAC delivery with my second child, all my research indicated that the best way to accomplish this was to delivery naturally. And it worked beautifully! Now I can hardly wait for my second VBAC delivery-- due in 10 days! Hm... I want a natural childbirth because I want that birth "high" that I've heard so much about!! :) I also believe my body was made to do this. If I can grow and birth a human being, I can do ANYthing!